Wann Langston, Jr. died April 7, 2013, following a protracted battle with cancer, surrounded by his children and very much at peace in his last months. In 1954, Dr. and Mrs. Langston, with infant daughter Karen in tow, then moved to Ottawa where Wann assumed the position of Curator of Vertebrate Paleontology at the National Museum of Canada. Three years later, daughter Sandra was born. He spent the summer months collecting specimens in the western Canadian plains and on Prince Edward Island. In 1963, the family trekked to UT Austin, where Prof. Langston spent the next 50 years contributing to the world’s knowledge of fossil reptiles. 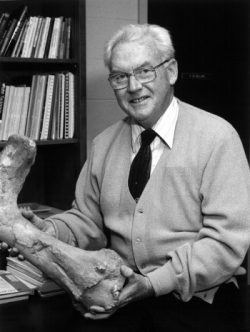 He served as director of the Vertebrate Paleontology Laboratory at UT from 1969 to 1986. His research spanned many groups of animals, and he is widely known for his work on North American dinosaurs, Permian amphibians, and North and South American crocodilians. Dr. Langston’s fieldwork continued to expand the collections at UT far past his retirement in 1986. After his retirement, he was responsible for reconstructing the skeleton of the giant pterosaur Quetzalcoatlus. His final work was a masterful and accurate reconstruction of the 6-foot long skull of Deinosuchus, which brought his career into full circle. Among his many honors is the RomerSimpson Medal, which was awarded to him by the Society of Vertebrate Paleontology in 2007. For those of you who missed that event, Wann read aloud an email from one of his daughters who asked if perhaps her father had made a typographical error in his note to her regarding yet another accolade, and if he was instead being awarded the Homer Simpson Medal. In true form, Wann then told the audience that having personally known Al Romer and George Simpson, a Homer Simpson medal was more fitting to his particular accomplishments. Of course, nothing could be further from the truth. Prof. Langston’s paleontological legacy is vast and diverse. It consists of field collections, skeletal reconstructions, an unparalleled personal library, and over 100 publications, as well as innumerable students and colleagues that have been touched by his knowledge and skills. Specimens that he collected or mounted can be viewed at the Texas Memorial Museum in Austin, the Perot Museum of Nature and Science in Dallas, the Houston Museum of Natural Science, the Museum of Texas Tech University, Big Bend National Park, among many others institutions around the United States and around the world. Dr. Langston also masqueraded as a tightwad, while donating among the most significant gifts made by any single individual to endowments in the SVP, the Webb School, and to UT Austin. The fruits of his mind and labor and the exceptional measure of his philanthropy ensure that Wann Langston Jr. will be known and remembered so long as the enterprise of paleontology carries on. Editor’s Note: Another excellent biography, “Wann Langston, Jr. – A Life Amongst Bones,” by Chris Bell, Matthew Brown, Mary Dawson and Ernest Lundelius, Jr. was published this fall as part of a special edition of the journal Earth and Environmental Science Transactions of the Royal Society of Edinburgh honoring Langston’s legacy. The biography is available online at: http://bit.ly/15utPwe.